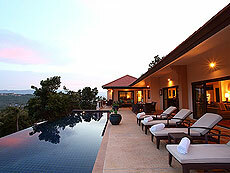 A luxury rental villa nestled on hillside at Choeng Mon area. A luxury rental villa located in the Choeng Mon where northeast of the Samui Island, approximately 15 minutes drive from Samui Airport. There is the infinity pool with sun terrace which can enjoy splendid scenery of the sea view and tropical green in front of the main living and kitchen-dining room. Full of villa facilities -audio room, theater room, 5 Bedrooms etc, are ideal for family and group stay in Samui Island.